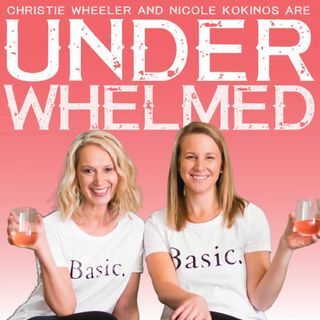 Underwhelmed is a weekly podcast hosted by the extremely relatable and occasionally funny thirty-somethings, Nicole Kokinos and Christie Wheeler. Inspired by the mediocrity of their jobs and the cities they live in (Baltimore, MD and Richmond, VA respectively), this self proclaimed dynamic duo sets out each week to provide joy to others by sharing the daily experiences, events, and things they are underwhelmed (and sometimes overwhelmed) by. Their mission is simple- to provide a safe space ... See More to vent, joke, and laugh about first world problems, and help their listeners avoid the same disenchantment by sharing the tips and tricks they use on a daily basis to help them live their best lives and avoid being underwhelmed. Underwhelmed is the perfect podcast for mildly inappropriate people that occasionally cross the line in their quest to be semi-successful adults. ​So take a break, grab a cocktail, and enjoy this dynamic duo's weekly discussions on life's most important issues and the things that underwhelm them.